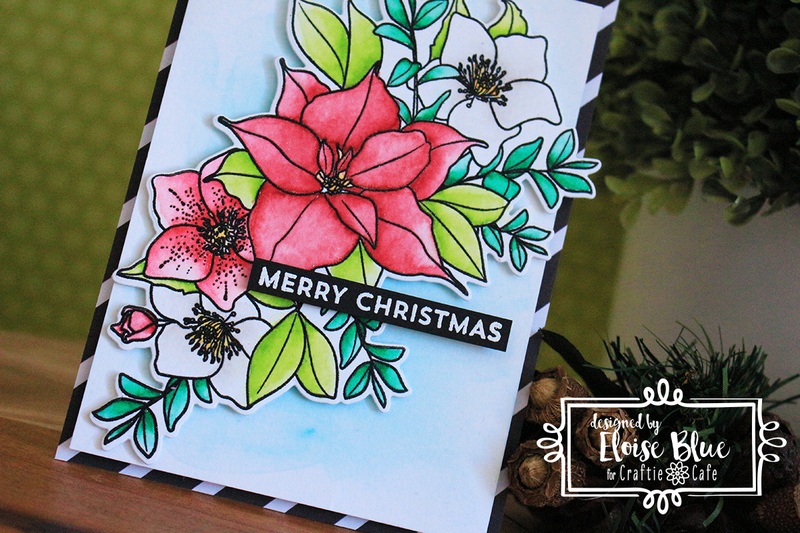 Hi everyone, today I’m back with a card for Craftie Café using the new WPlus9 Christmas Rose Bouquet and My Favorite Things Snow Globe Sentiements set. I’ll also be using my Zig Clean Color Real Brush Markers to colour in my large bouquet today also. 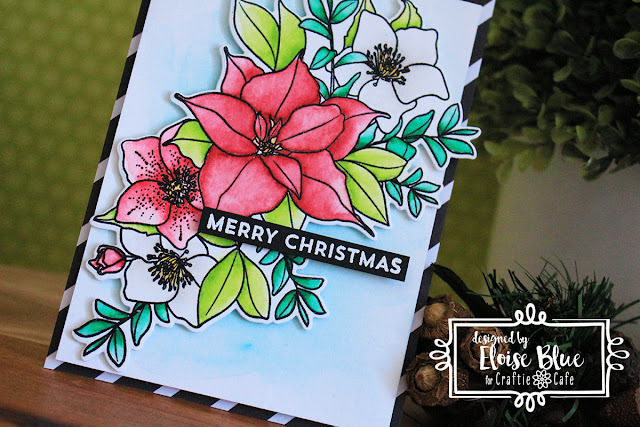 To begin, I stamped my large bouquet image from the Christmas Rose Bouquet stamp set onto some Tim Holtz Watercolor Cardstock with black ink, then clear heat embossed over the image also. To colour in my image in, I used various colours of Zig Clean Color Real Brush Markers and a water brush. I scribble the colour where I want it to be darkest, then I pull that colour out with a water brush. Once I coloured my entire image, I used the coordinating dies to cut it out. Next, I used some Distress Inks to ink blend onto another piece of watercolour cardstock. I used Tumbled Glass, Peacock Feathers and Salty Ocean to ink blend into the centre of the cardstock, then I used a paintbrush with some water to move the colour around. Then used a paper towel to mop up the edges to create a light blue watercolour base for my flower to be adhered over the top of. 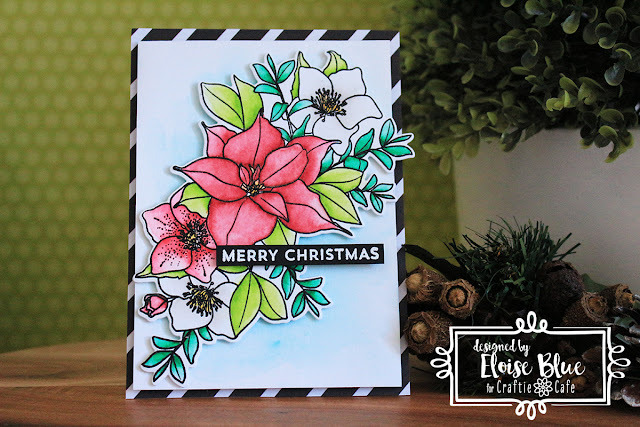 I used foam tape to adhere down my flower to the base, then took the Snow Globe Sentiments set from My Favorite Things to white heat emboss the simple Merry Christmas sentiment onto some black cardstock. I cut it down into a strip and adhered it with foam tape also. To finish off I adhered my panel onto a piece of black and white striped patterned paper and then onto a card base. Thanks so much for stopping by today and I’ll catch you next time.